Time to upgrade your fairy gardens, or balcony or office desk with these little bright artificial? Imagine getting the look without the hassle with the small fake plants. Featuring 16 artificial succulents bulk plants without pot, this extra value indoor-outdoor greenery set is our bestselling faux succulent plant assortment! Forgetful or don't have time to worry about nurturing a growing garden? Fake succulent plants for decoration is the hassle-free solution! As artificial plants for outdoors-indoor our unpotted succulent fake can be used when decorating altars, churches, offices, parties, receptions and succulent wall decor. You don't need a green thumb to create a realistic looking at home or office. The ideal terrarium decorations for those can be created with NATAMZ faux cactus. Who wants the look without the fuss, creating and decorating easy can be done with the small succulent plants fake. Effortless elegance at last! Ready to experience the difference? Click 'ADD TO CART' to order your unpotted faux succulent mix variety kit! 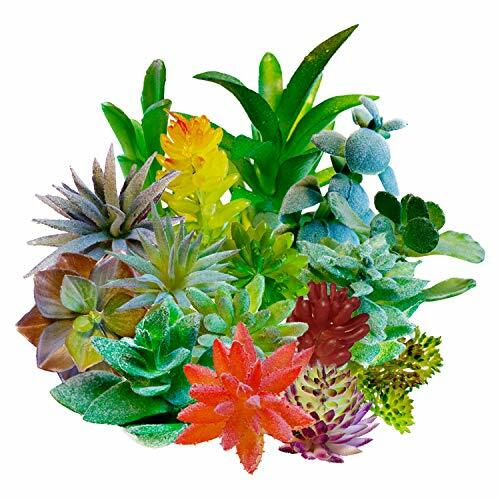 16PCS ALL SEASON ASSORTED SUCCULENTS: Containing (16) various 1-5" artificial succulent plants including stem, this is the ultimate faux greenery bulk bundle. Bunch the faux succulents together or use our succulents fake individually to decorate the home, office, wedding venue, dorm room, restaurants and more. NATAMZ'S 100% SATISFACTION GUARANTEE: We stand behind the quality of our faux cactus plants. Plastic succulents are backed by a money-back guarantee, NATAMZ mini succulent plants are the smart picks. Purchase with confidence our mini succulents. Order your unpotted fake succulent kit! View More In Artificial Plants & Greenery. If you have any questions about this product by NATAMZ, contact us by completing and submitting the form below. If you are looking for a specif part number, please include it with your message.